How did Dr. Spencer contract Ebola? 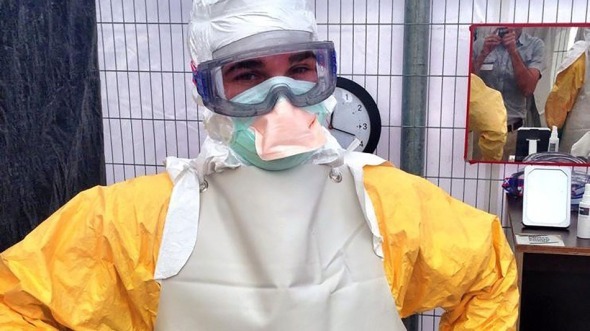 Dr. Craig Spencer in full Ebola gear before his trip to Africa. Two Doctors Without Borders clinic staffers — a hygienist and a social worker — spoke about Dr. Craig Spencer on condition of anonymity because they were not authorized to talk to the press. The American doctor who caught Ebola while treating patients in Guinea was a hard worker who conscientiously followed safety procedures, the two colleagues said Saturday. Dr. Craig Spencer is being treated for Ebola in New York City after coming down with a fever on Thursday, about a week after he returned from Guinea, and the morning after traveling on the subway in NYC and going to a bowling alley in Brooklyn, among other places. The 33-year-old was working at a Doctors Without Borders clinic in Gueckedou, in southeastern Guinea, according to two members of the clinic’s staff. Doctors Without Borders has been a major provider of care during the current Ebola outbreak and in all recent ones. Its procedures for everything from how clinics should be set up to how doctors and nurses should take off protective equipment are considered the gold standard when dealing with highly infectious diseases, like Ebola. At Ebola clinics, there are elaborate procedures for how health workers undress and disinfect their equipment and the site, and the hygienist said the disinfection teams at Gueckedou make sure those procedures are followed to the letter.